All the people who have been injured by Chrysler, and the Defendant...has fled the country with our tax money. What's worse, our government held the door open for them. The Supreme Court thought about stopping them. They stopped Chrysler at the door and asked them to wait for a day before the sale to Fiat was allowed to happen. Then they decided that the safety and Constitutional Rights of the American people weren't important enough to take a closer look at the issue and then opened the door wide so that they could escape the people they have injured. At least, that's how it feels. That said, I still believe in our government, President Obama, his Administration, our Congress, and our judicial system. I just think that they, like all humans do, made a mistake. I think that this immunity from product liability was slipped into the middle of a bunch of extremely complicated issues and they didn't think this simple one through. I imagine they thought something along the lines of "too bad for the 300 or more people who have been injured by Chrysler, but that's what happens in a bankruptcy." They didn't think about the people who might be injured in the future, including themselves and their loved ones. They didn't think about the fact that our money was being used, which should require Chrysler to have more responsibility to the American people, not less. They didn't think about the impact this has on our Constitutional Right to a Civil Trial. In regards to this issue, they simply didn't think. Now they have a chance to fix it. GM is pursuing the same course of action that Chrysler took. A report came out today that predicts approximately 3,400 injuries and deaths will be caused in the first year by the vehicles that were sold by GM and Chrysler before their bankruptcies. The report shows that at least as many injuries and deaths can be expected each year over the next several years. The fact is we won't know, unless something changes, because injuries and deaths caused by defective Chrysler or GM products sold before their bankruptcies (over 99 million vehicles that are registered and in use on the road today) won't be tracked, and the defects won't be fixed! As I said, I believe in our government, and firmly believe they will do the right thing here, but as soon as a solution is proposed we will need to show our support for it by speaking out for change, as we did during the election. Are you willing to do that? Now, enough of the political stuff. (Although, if you think about it, it's not really political, it's a matter of our safety!) I promised some things at the end of my last post. One promise was that there would be pictures. Obviously the pictures above have a lot to do with the earlier paragraphs, but I've wanted to share them with you for a long time. 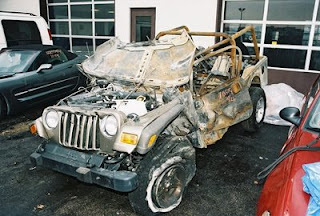 One picture shows the jeep sitting on all four wheels. 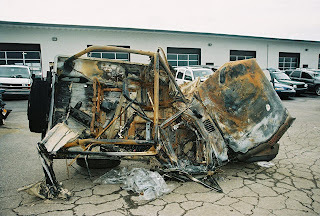 You can see how the fire damage started in the back of the engine and moved back into the jeep, the paint still looks fresh on the grill, where the fire didn't get to it. The other picture shows the jeep on it's side, which is how it was positioned after the accident, while I was still in the driver's seat. Another promise was that I would tell you about my new Prosthetist and some new goals. For reasons that I can't get into right now I've decided to switch to a different Prosthetist. He lost his left leg at the age of three in a lawn mower accident. He uses a C-leg that is very similar to mine. He's been in the Paralympics and is extremely active. In between trips to DC, I managed to find time to meet with him. During our first visit he watched how I walk, looked at the alignment of my legs, and spent quite a bit of time talking with me about my progress. He has some ideas and thinks that he can work with me to improve the way I walk. In fact, he thinks that he can help me to walk without the crutches! Now, I have to admit that I'm skeptical, but I'm willing to give it a try. This won't happen over night, maybe not even in the next year, but it's nice to have something to work toward again! In regards to the issues that the Chrysler and GM bankruptcies have created, things are happening (lots of good media attention) and I will keep you updated. It's pretty much all I'm focused on these days. I'll keep you apprised of any changes and how you can help. For now, please share these issues with your family and friends and keep checking back to see if anything new is happening. I've been trying to leave posts up for a week before writing a new update, but that may change soon, so keep checking back to see if there's anything new! As disturbing as those pictures are to look at and remember the exact location/date/time when I found out, the story MUST be told....let us know if there is anything we can do on this end. See ya on July 1st..
Oh my goodness... Shocking pictures that just show more and more how important it is for car companies to fix defective parts in their vehicles. God surely was with you that night and the Angels that pulled you from that wreckage are amazing. Glad you lived through that horrific ordeal and are here to tell your story and help others. Keep on keepin' on! !